This vintage black loungewear is 100% nylon. It can also be worn as an evening jacket. 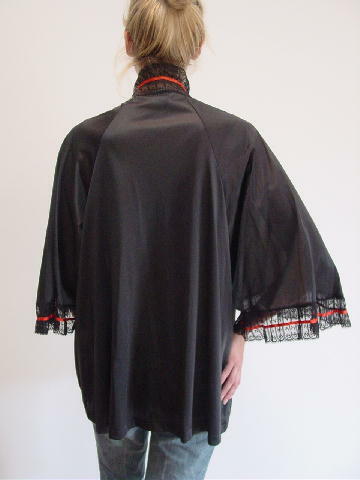 There are 3/4 length kimono sleeves and at the sleeve ends is 2 3/4" wide black lace with red ribbon in the center. The same black lace goes all the way around the neckline and down both front sides. If you have a thinner frame you can get a long black ribbon and use it as a belt. It's from a former Czech model who used to wear it both as an evening jacket and loungewear. She even wore it when she was pregnant. neckline to end of sleeve 22"
bottom hem side to side 30"
armpit to armpit 25 3/4"
sleeve bottom end to end 15"